If you’ve decided to purchase a Toyota Camry, it is a choice you won’t regret! 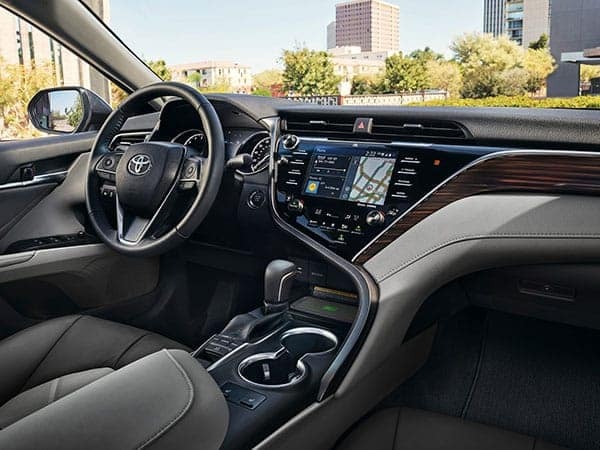 This value-loaded, amazingly equipped midsize car is one of Toyota’s standout models in a lineup that’s full of solid options. And if you’ve decided to buy yours from Toyota of Longview, that makes it even better! You clearly have a good grasp of quality and value, and you know that a great deal is yours for the taking at our dealership near Tyler, Henderson, and Marshall, TX. Now that the big choice is settled, have you given any thought to whether youíre going to pay cash for your Camry or finance the cost? There is no wrong way to pay, and either choice results in driving home this fantastic car for a bargain, but you owe it to yourself to explore all your options so you can make the best decision for your situation. Keep reading to find out the benefits of both paying cash and financing with an auto loan. Of course, the most compelling reason to pay cash up front for your Camry is that youíll own it free and clear from day one. This is the simplest of all transactions; you hand over the cash, we hand over the keys, and you can be on your way! With no extra details or financing arrangements to figure out, you’ll be free to fully enjoy the excitement of driving away behind the wheel of the amazing car that you just purchased for an equally amazing price. If you’ve been saving up for this purchase or have funds from selling your previous vehicle ready to put down on this one, a cash purchase is a wonderful, stress-free option. Or, you could pay a portion of the cost of your Camry in cash and then finance the rest. By paying down some of the cost with cash, you can get lower monthly payments on your loan and achieve full ownership of your Camry faster than if you had financed the full price. Another popular payment method is auto financing. At Toyota of Longview, we work with a huge network of trusted lenders, and our team will work on your behalf to secure the best possible auto loan for your Camry purchase. An auto loan will allow you to pay off the cost over time, in smaller and more manageable increments. This is more feasible for many people, who don’t have the lump sum of cash to hand over at the time of the sale. But financing has other advantages in addition to allowing you to spread out your payments over a period of months or years. It can also improve the financial outlook for people who haven’t yet established a solid credit history or who are looking to improve their credit score. And you might be able to take advantage of savings opportunities if you finance through one of our preferred lenders. Ask our financing team for details! Great selection, low prices, and fantastic customer service await you when you shop for your new or used Camry at Toyota of Longview. And those things are all yours to enjoy regardless of how you choose to pay. Explore our inventory online to find the Camry model of your dreams, and then visit our dealership when you’re ready for the fun part, test driving your favorites.